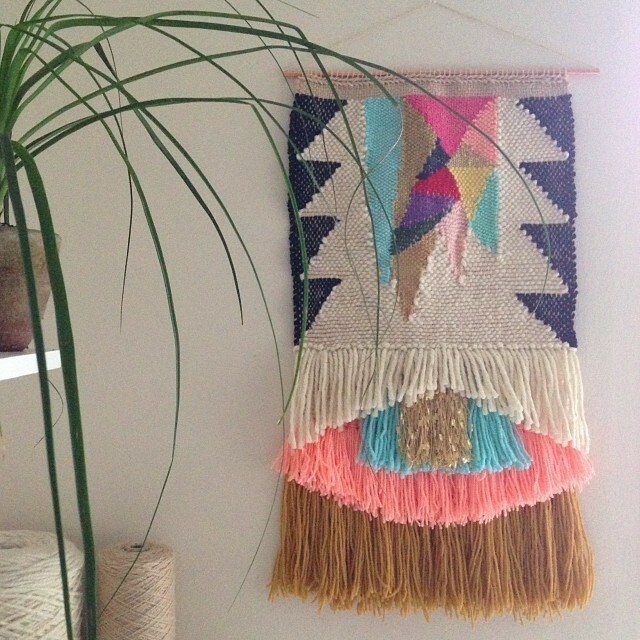 I am loving the DIY and materials revival we're living in. What was once tacky and dated is beautiful again and it's thanks to wonderful makers like Maryanne Moodie that we can catch a glimpse at how accessible these handmade crafts really are. Her in-progress photos give us all hope and tease out of us that "wait, I think I can do that" feeling that's so addicting to us makers. As the gear rotates a quarter turn, alternating warp threads are pushed up. Rotate it another quarter turn and the threads that were above are now slotted down into the grooves and the yarn that was lower is now higher. A pretty clever tool, right? The basis of weaving is to get the "weft", that is, the thread that fills up the project from left to right, through these alternating warp threads. 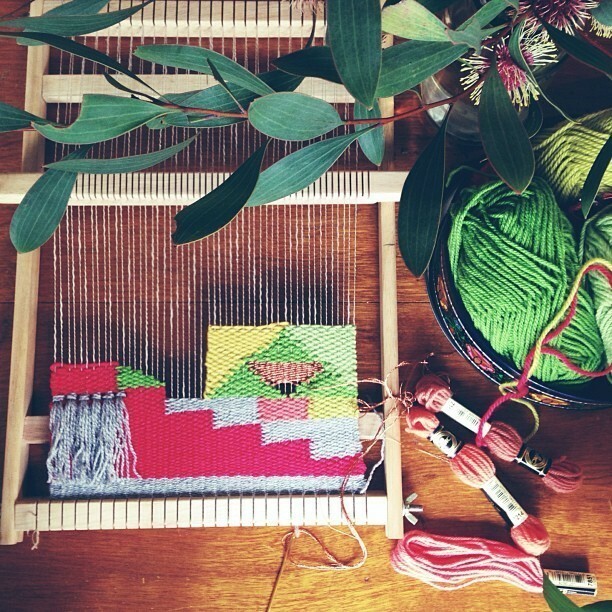 You can do it will a long needle, a crochet hook, or by hand, but weavers often use a "shuttle". 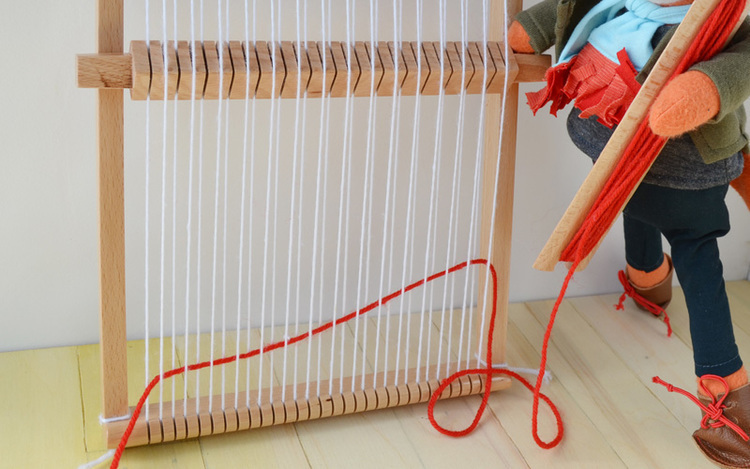 Wrapping the horizontal yarn that will fill your design around this flat, pointed piece of wood makes it easier and faster to slide the weft between the narrow gap of the alternating warp threads. 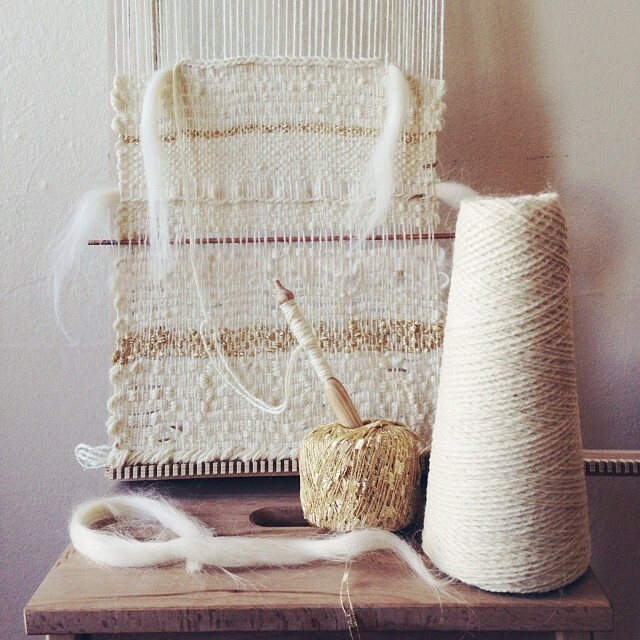 In this second photo of Maryanne's in-progress work, you see a creamy weft thread coming down from the project and wound around a tapestry bobbin, which, like a shuttle, helps move the horizontal yarn through the warp. A bobbin is more maneuverable than a shuttle and allows the artist more freedom in her designs. 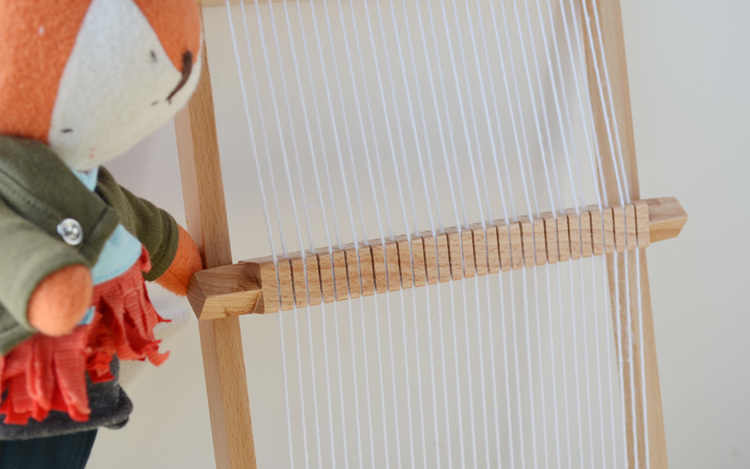 For detail work, she may go through the warp with a bobbin or needle and weave the geometric shapes by hand, without a heddle (like the rotating heald shaft gear) to help raise and lower the warp. Although it takes longer than using a heddle, the by-hand approach of picking up every other warp thread gives her time and space to work her signature style. 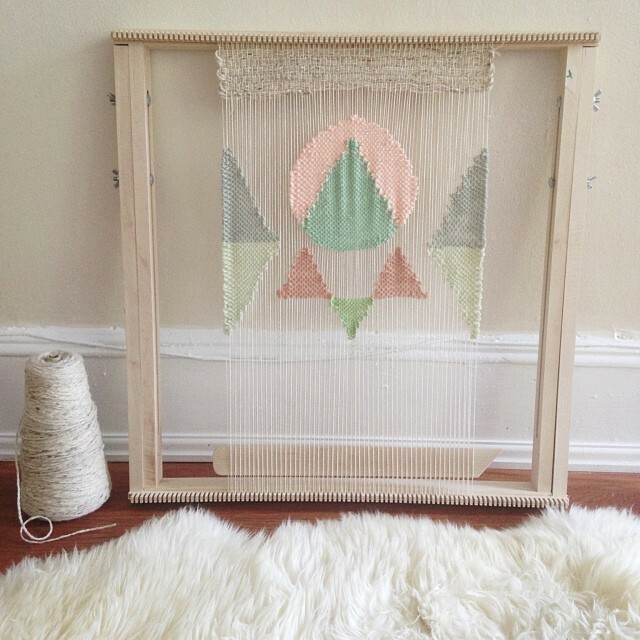 The artist has some favorite techniques that pop up across her many weavings and with a little experimentation, we can try to capture these same beautiful textures and shapes for ourselves. As you see in this photo, she often begins a project with a thicker weft yarn and weaves it diagonally across two rows to achieve a series of "v" shapes that look like a column of knitting. By taking the yarn over two strands and then back under one and repeating it—not unlike a backstitch in embroidery—you can create a similar effect. 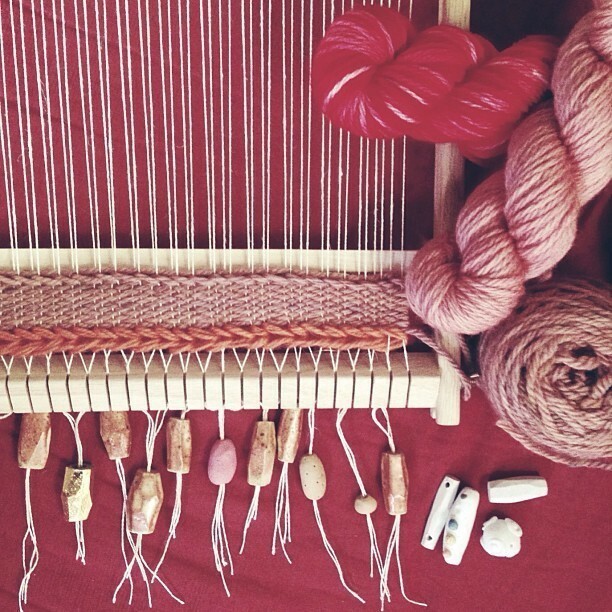 The pink yarn towards the unfinished edge of the weaving shows what one row of this "backstitching" looks like; while the salmon-colored yarn at the bottom shows two rows and that characteristic v-shape. We can likely take many techniques from embroidery to weaving to help break up the flat back-and-forth rows. 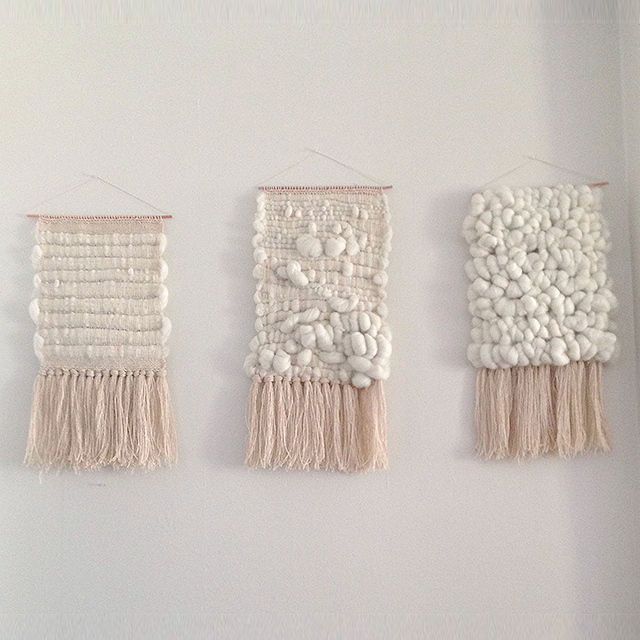 Finally, there are the tassels, another signature of Maryanne's work. 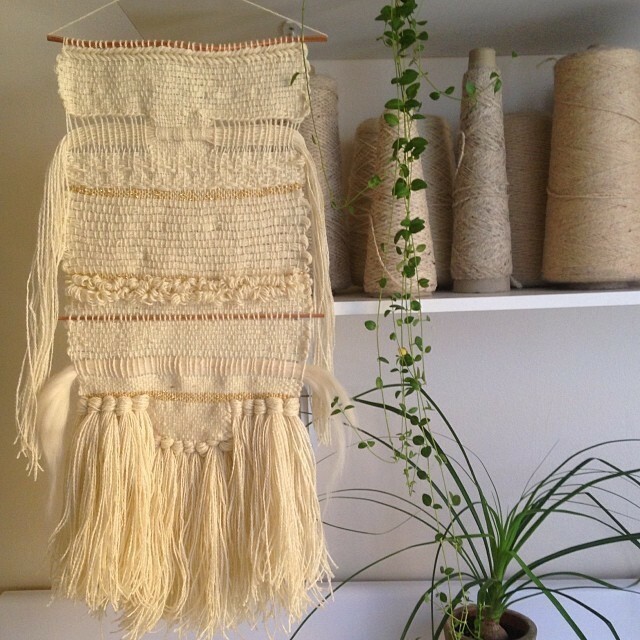 For this, we can borrow from macramé, the art of knot-tying popularized in the 70's with jute plant hangars (which is also making it's own revival). With a number of yarn threads all cut to the same length, tie a larks' head knot around two warp threads and a weft thread, stabilizing the tassel in all directions. For the diagonal angle, tie the next knot one (not two) warp threads over and just below the first, following a line down towards the triangle's point and back up to the far side. Finally, trim the tassels straight across or at an angle to the knot heads. 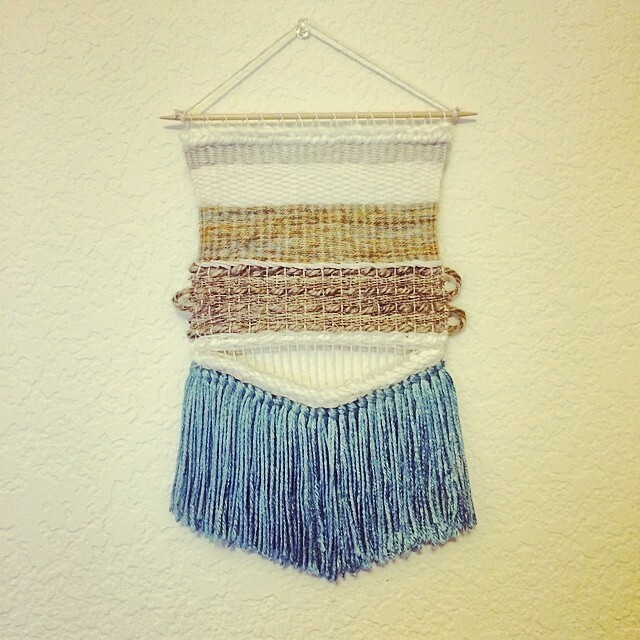 You can repeat this for a many-layered look, adding depth and movement to your weaving. All photos but the last are copyright their respective owners. I found a bag of discontinued yarn at Goodwill for $4, still skeined. The cheapest swift and winder I could find online was $60— a no-go for me. Buying secondhand yarn would be even more expensive than buying it new, where you can get your cakes wound for free at the yarn store. 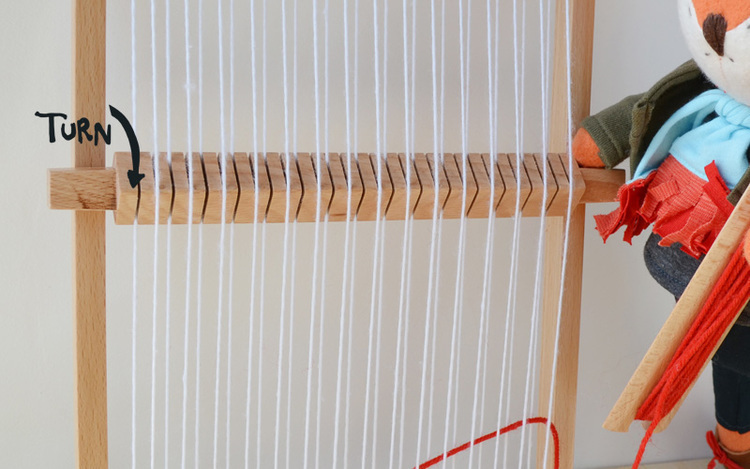 Put your yarn skein around the wine rack. Duct tape the wine rack to the lazy susan while holding it taut against the yarn skein. Make sure the tape is placed in opposite directions, at least 4 pieces, or it will collapse inward. The weight of the rack will keep it from falling over. Then hold your turkey baster in your left hand and wrap the yarn around with your right, first perpendicular until you’ve got a good two layers of wraps, then at a 45° angle, with the wraps 1/4” apart, slowing twisting the baster with your left hand. I used this tutorial to learn how to use the turkey baster as a nostepinne, the old-fashioned winder. 15 minutes later and I had wound my first cake! I've basically been crushing on this Microfilm lamp on Etsy for months now, but couldn't bring myself to buy something I could mentally reverse-engineer in about 10 seconds. A while back, I came across a very informative interview with the artist on Craftzine.com and decided now it was time to make one. 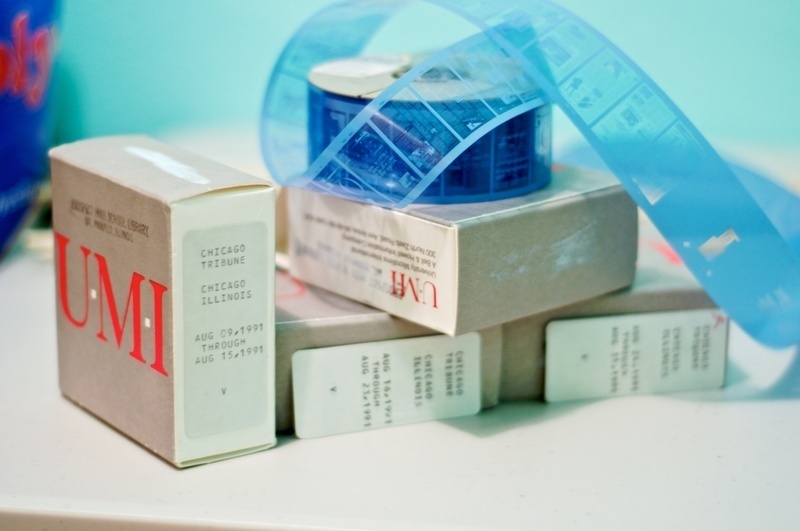 I contacted a seller on Ebay who just happened to have some 1990-era microfilm of the Chicago Tribune, where my very best friend, Heather Billings, (@hbillings) now works. After a few failed attempts to get the woven-dowel look to work, I settled for a basketweave modification of the inspiration lamp. Here are some pictures of the process if you'd like to copy it yourself! 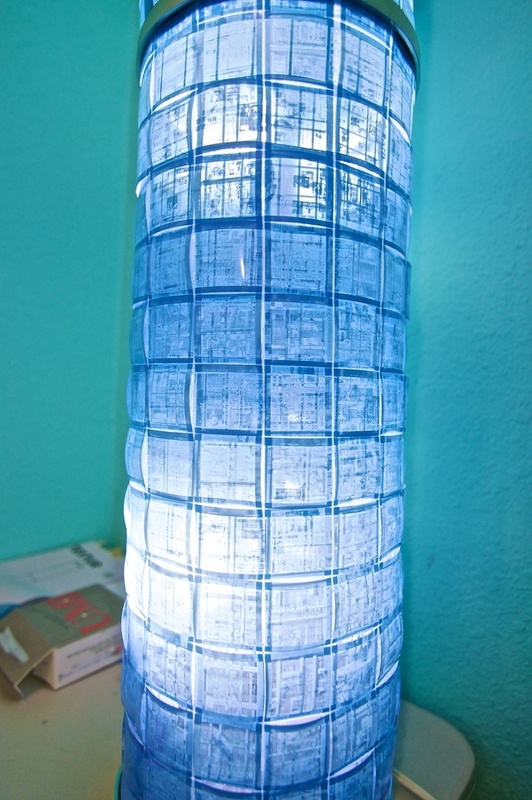 Note: I originally started out with a two-tiered Ikea Textur lamp, but the weight of the film was too much, and the sides started buckling. Even after adding clear plastic reinforcement, I found I had to downgrade to the single-tiered table lamp to keep it from bowing in the middle. If I had gotten doweling with a smaller diameter, it would have worked! Anyways, I thought it would be fun to include the directions, which I also 'hacked' from Ikea's website. Remember to buy dimmer-friendly candelabra base lightbulbs! -> See the whole album on GooglePlus. In case you missed it, yesterday was the second annual International Yarn Bombing Day, where knitters, crocheters, and other needlecrafters set out all over the world to decorate a public space. Yarn bombing is a relatively new form of street art, but it's becoming more common in larger urban areas. One of my favorite yarn bombs is the neon-colored crocheted Wall Street Charging Bull by Agata Olek on Christmas Eve, 2010. Since then, yarn bombing has been featured in articles on Forbes.com, the NYTimes.com, Reuters, and the Today Show Blog, largely on the part of people like Leanne Praine (@LeannePraine), co-author of the bestselling Yarn Bombing: The Art of Crochet and Knit Graffiti and Hoopla: The Art of Unexpected Embroidery. So I set out in March of this year in the shadow of many talented knitters and crocheters, determined to yarn-bomb a lackluster part of downtown Bellingham, Washington. The pedestrian crosswalks here have concrete structures lining the paths. They're about hip-height, squatty, and ugly; and I was in the middle of a rant about how boring they where when I realized they were about the same shape as a well-known robot from the popular Star Wars films. On March 16, 2012, I "cast on" my very own knitted R2D2 slipcover. There are plenty of R2D2 hat and toy patterns on Ravelry.com (@ravelry), a great pattern site for knitting and crochet, but nothing was near this scale. (For any who would like to recreate this project, I'm happy to share the makeshift pattern you see on my iPad in the Instagram photos below.) Basically, I had to create a tube 56" around, 23" high, and then curve into a dome over about 14". It was a tricky bit of math, but nothing harder than freshman geometry. I ended up using just about 1200 yards of yarn. I had it nearly finished on Friday, June 8th, and set it up outside my office, where I work downtown. Some coworkers and friends visited to see if I really had finished it. A few of them even posted photos on their Twitter accounts. I didn't even realize until the next day that Leanne Praine, the author I mentioned above, had picked up on those tweets and was demanding, "Who made this? 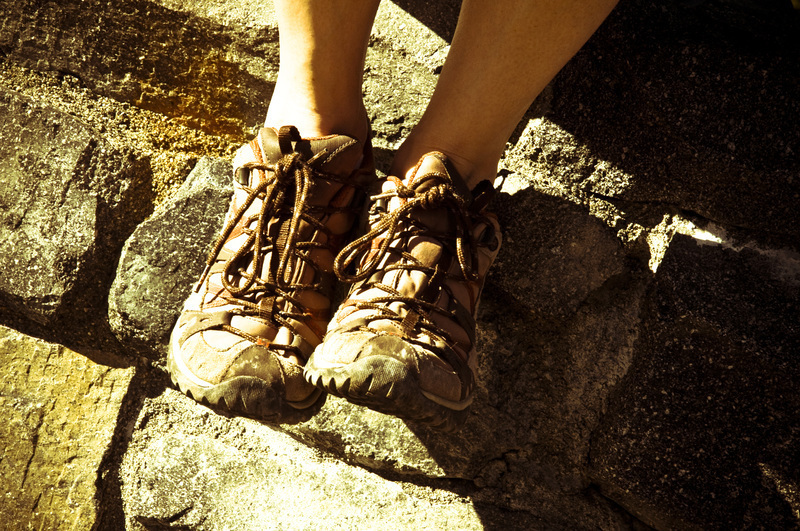 Own up, because i want to know who you are and personally acknowledge your awesomeness." I had some small tweaks to finish before the actual event on the ninth, so I took R2D2 back home to add the large eye and a drawstring around the bottom to keep it from rolling up along the bottom. Around 10am Saturday morning, I finally made it down to the Bellingham Farmers Market, where I figured there would be enough foot traffic to notice the strangely-adorned concrete pillar. After I fitted him over one of the structures, I sat at a nearby coffeeshop and shot some photos of passers-by while my husband (@MattRudder) tweeted about the occasion. I did not expect the incredible support I received from other knitters, crocheters, and even people who likely never heard of yarn bombing before. 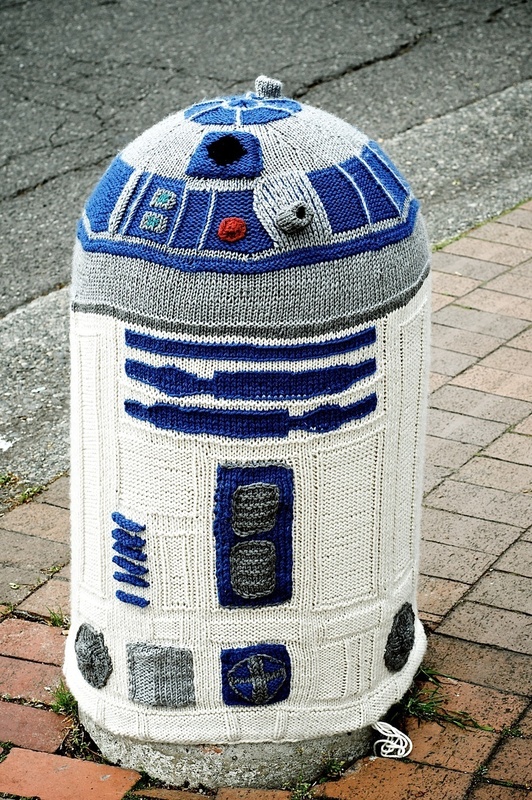 Somehow, R2D2 made its way back into the feed of Leanne Praine, who tweeted to my husband, "This might be one of my favourite yarn bombs ever! Kudos to your wife!" 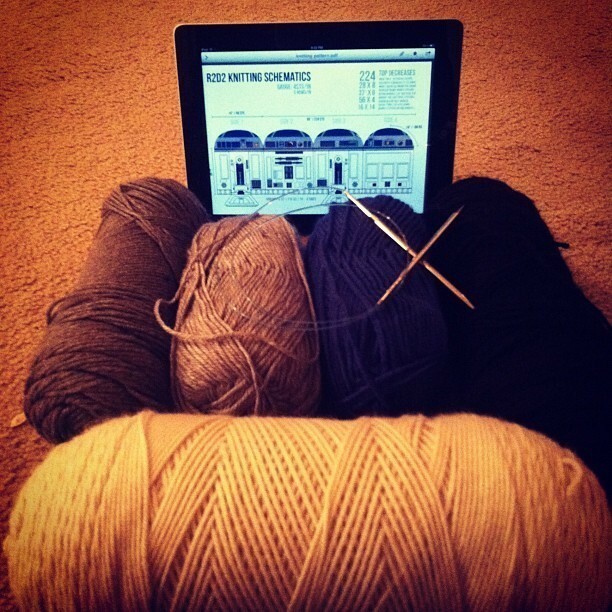 and told her followers, "Yarn bombers, give @sknep a digital high five for making the knit R2 D2!" Other Twitter and Instagram users started sharing it, and this morning, my husband showed me a photo of R2D2 on Reddit. Then it showed up on Neatorama's Facebook page. I never would have expected such an overwhelmingly positive reaction. Thanks, all of you! Some of the Reddit readers voiced their concerns about the longevity of a yarnbomb like this. To answer those questions, I actually didn't leave the yarnbomb on the pylon overnight. I removed R2D2 when I left, and plan to add "legs" and hide speakers in it for next year. Even if I had left it out to weather the elements, R2D2 is made out of an acrylic yarn that wouldn't bleed, fade, or stretch for quite some time. It just happens to be graduation weekend and this is a college town, and I have grown attached enough to this project to not want it's 'lifespan' cut short unnecessarily. I've only had my eye to a viewfinder for a year now, but it doesn't take long to recognize the ruts of the amateur photographer. We take shortcuts, lose our settings, forget to change the film speed (yes, I'm still bitter about half a wedding shot in 500 ISO) and get to thinking we've really mastered this hobby on which we spend half an afternoon each month, only to get back to our computers, plug in a card, and watch our mediocre snapshots plateau. What we need is a reminder to get out of these bad habits and keep shooting. One thing I never do—anymore—is take that little eyedropper, click in the brightest part of the image and hope all the colors come out right. You'll almost always end up with blue zombie-looking faces where your friends should be. Every light source—a bathroom fixture, chandelier, noonday sun or sunset—has a different color temperature. 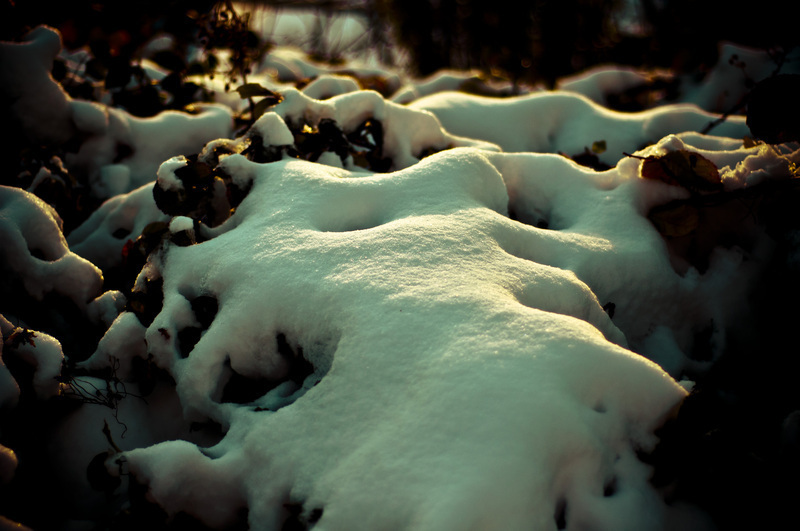 If you were to carry a piece of white paper around with you all day, you'd see how white is never really just white. That's why one-step photo editing commands that force the lightest part of every photo to the absolute brightest value a computer monitor project end up actually making the photo less "accurate," despite its attempt to "color-correct". Shooting in a raw format helps make color temperature adjustments easier and improves color quality overall. 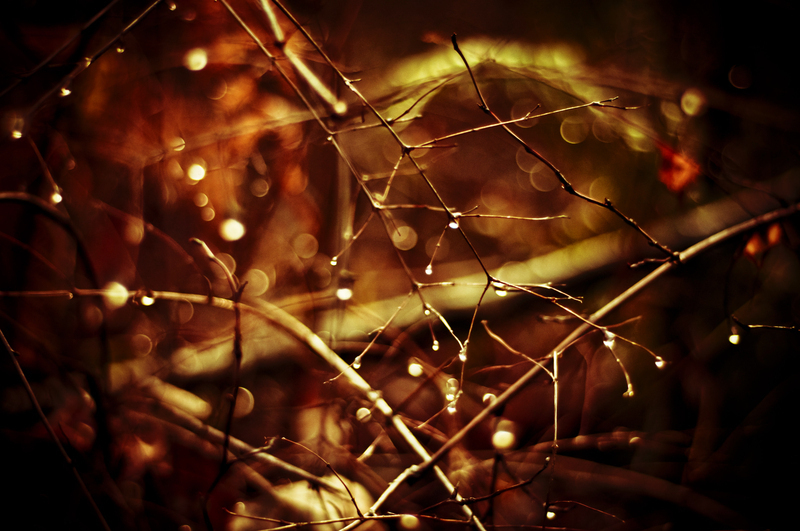 Even if you shoot in JPG, color-adjusting is still a matter of preference. Remember that you're not just making a facsimile copy of the action in your frame—there is no one right way to process a photo, and learning how to use the color temperature to your advantage is key to taking the average photo to the next level. Yellower light reminds us of sunshine, and it makes skin tones healthier and warmer. Bluer light can really add to otherwise plain still life shots. Don't be afraid to cross process a photo either; warm light and cool shadows look a lot like sunset or sunrise and really showcase the difference between your key and fill lights. I probably have a hundred of these tilted photos. MySpace made them popular, but they've become the staple of everyone who entered photography in the last 5 years. Too often, we amateur photographers take what we know to be a boring composition and figure that by tilting the plane a little, we'll end up with something really spectacular. Really, it's more of a cop-out; we'd rather tweak our wrists than our minds. If you're tempted to take one of these, stop and think, "Would this still be a picture worth taking if it didn't lean like a cholo?" I never would have taken what ended up being my favorite photos of the whole year if I hadn't been challenged by another photographer to shoot no matter what the weather. 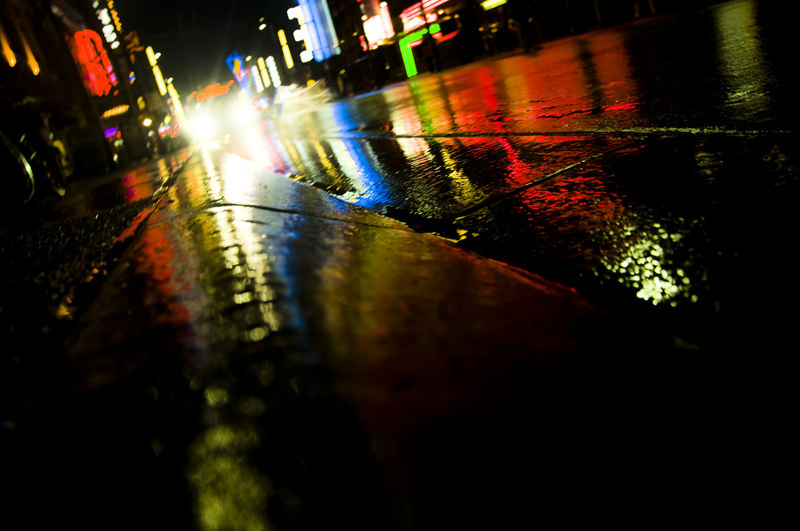 The inspiration came from a photo of the quintessential black-and-white New York street, busy with countless shoppers ignoring the rain that offered the perfect amount of reflection and disguise against the asphalt. That evening, I went to Vancouver with some friends; a hundred admittedly horrible shots later, I turned up with this set that closed out the night. My camera equipment weighs in at about $2k new—I'm no starving college student but "graphic designer" isn't really anything to brag about either. It's definitely easier to keep it in my hands rather than entrust it to a life force other than my own. Of course, that would mean admitting I wasn't the center of my own universe and that, potentially, someone else could have a happy accident instead of me and take a fantastic shot or two. When I can get over myself long enough, I find out that friends who take my D90 on an adventure end up coming back with some really fun shots of their own; and they're usually considerate enough to point the lens back at me. It sure saves me the awkward self-portrait look. 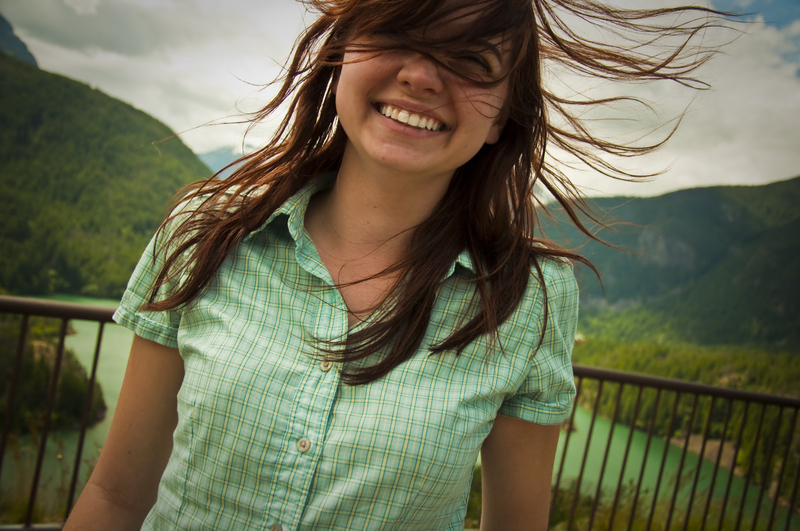 People, not landscapes, make the best subjects. Forget bridges, sunsets, mountains and lakes—the people you take with you on your photo journey end up being the star of it. You'll learn plenty more from trying to shoot people than scenery. Honestly, I wouldn't have it any other way. These are great photos because I love the people in these photos; it's their personality that drives the picture, not how steadily I managed to hold the camera while they graciously posed for me. 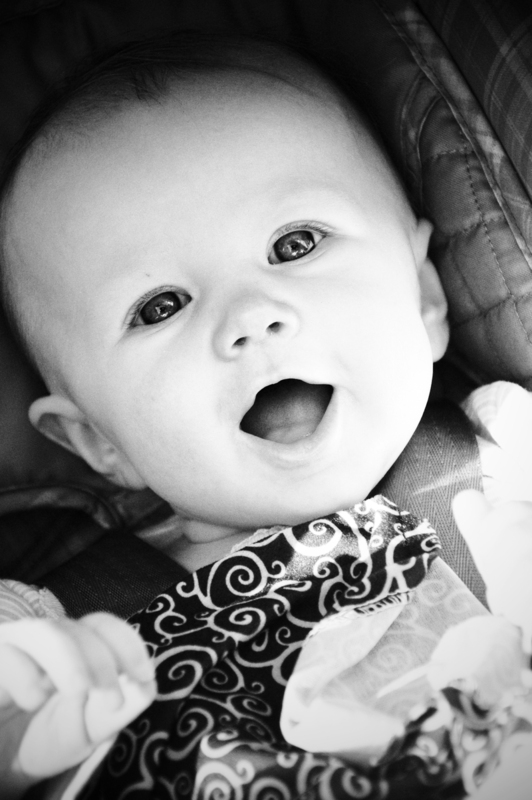 Over and over again, so many of my favorite photos are near-misses. If I hadn't crouched down to see the water drops or the bee on a flower; if I'd decided 200 was enough photos of Grace (my baby niece) for one hour; if the 15 or so photographers up at Baker the same time I was really had managed to keep me from moving fifty feet down the trail to another vantage point; if I hadn't run out to the prow of the boat in the rain, or zoomed in when I had just finished a panorama, or kept clicking the shutter when I couldn't anticipate what would happen... I wouldn't have any of the pictures below. In fact, I had to say "yes" to every one of these moments in order to get a picture at all. 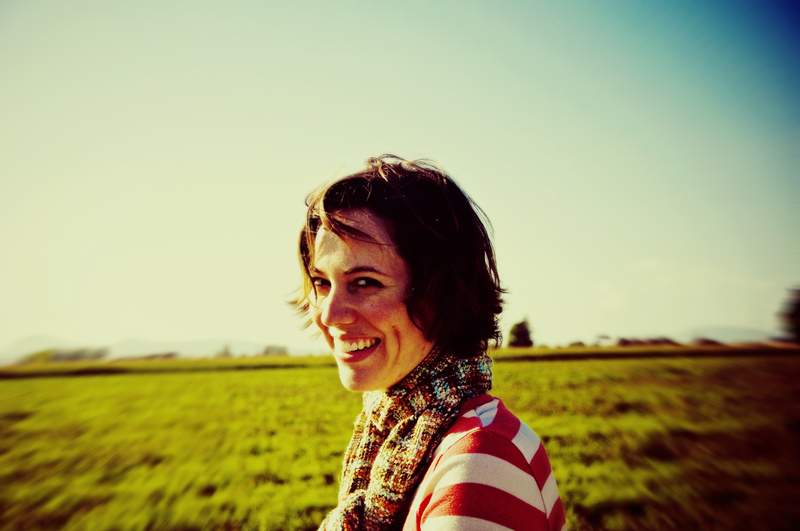 Sarah Rudder is a California native who started, like many other designers, in print magazine layout. She moved to web and marketing design during a 4-year stint in Washington state and found fulfillment in taking designs all the way to implementation, bringing a history in journalism and communication to modern web standards and development. She spends her free time geeking out over language, puns, grammar, brewing mead, and knitting.